Euro-zone producer prices rose more than expected and business activity expansion slowed less than expected. 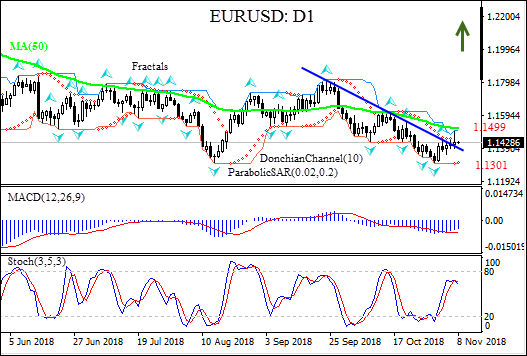 Will the EURUSD recovery continue? Recent euro-zone economic data were better than expected: business activity expansion slowed less than expected in October as Markit’s Composite PMI declined to 53.1 from 54.7 when a reading of 52.7 was forecast. And producer prices grew 4.5% in September instead of 4.2% as expected. At the same time headline inflation up-ticked to 2.2% in October from 2.1%, as unemployment remained steady in September at 8.1%. Positive euro-zone data are bullish for EURUSD. On the daily timeframe EURUSD: D1 has breached above the resistance line but didn’t manage to breach above the 50-day moving average MA(50). The Parabolic indicator has formed a buy signal. The Donchian channel indicates no trend yet: it is flat. The MACD indicator is below the signal line with the gap narrowing. This is a bullish signal. The stochastic oscillator is falling but has not reached the oversold zone yet. We believe the bullish momentum will continue after the price breaches above the upper Donchian boundary at 1.1499. This level can be used as an entry point for placing a pending order to buy. The stop loss can be placed below the lower Donchian channel at 1.1301. After placing the pending order the stop loss is to be moved every day to the next fractal low, following Parabolic signals. Thus, we are changing the probable profit/loss ratio to the breakeven point. If the price meets the stop-loss level (1.1301) without reaching the order (1.1499) we recommend cancelling the order: the market sustains internal changes which were not taken into account.